Mark Abel’s critically heralded previous release on Delos, the orchestral cycle 'The Dream Gallery', signalled a radical and culturally relevant new approach to the American art song. 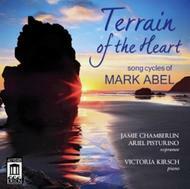 With 'Terrain of the Heart', Abel takes a fresh look at the idiom, while working within the genre’s more traditional framework: as a recital vehicle for solo voice and piano. Abel’s hard-­hitting lyrics leave a lasting impression, burrowing all the deeper into one’s consciousness when amplified by his sophisticated musical fusion of classical and rock, aimed at broad-­minded listeners, classically couth or not. Of the three cycles offered, The Dark-­Eyed Chameleon radiates particularly intense personal emotion, tracing the agonizing breakup of Abel’s own love affair. The thematically diverse Rainbow Songs offer a certain unity of sentiment and musical language. The Five Poems of Rainer Maria Rilke explores the German master’s subtly mysterious inner visions. Sopranos Jamie Chamberlin and Ariel Pisturino, with pianist Victoria Kirsch, offer committed and convincing performances.